Follow these steps to integrate MAT, Mobile App Tracking by Tune in to your game. MAT attribution is a server based service from Tune that sends attribution data on your players to deltaDNA from the MAT servers. There are 3 steps required to get this configured. 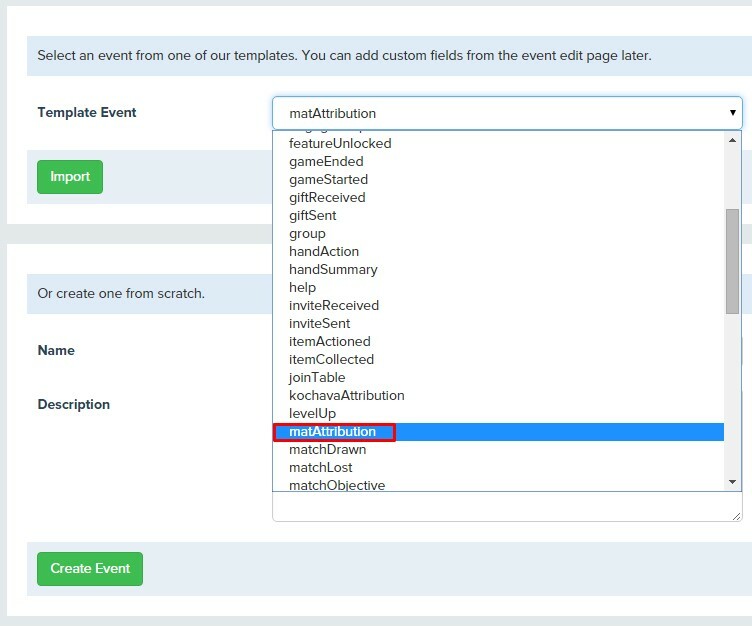 1) Add the matAttribution event to your game by selecting the event from the Template Events list on the Create Event page that is accessible from the SETUP->TOOLS-EVENTS navigation menu in your development environment. You can also reach the Event Creation page by clicking on the Create Event button at the top of the Event Management page in your DEV environment. 2) Notify MAT of the userID your player will be using in deltaDNA when they send events from your game. You can do this when the game is run for the first time by calling the MAT “setUserID” function in the MAT sdk and populating it with the userID that the deltaDNA SDK is using. Visit MAT for further details on their setUserID function. This will make the deltaDNA userID available to the MAT postback from that point forward. Regardless of whether you are using your own userID or an anonymous one generated by the deltaDNA SDK, it is critical that you communicate the player’s deltaDNA userID to MAT through their setUserID function. If you don’t your attribution data will not be recorded. 3) Setup the attribution post back on your MAT Console, instructing it to send your attribution data to deltaDNA. Where should be the environment key for your LIVE environment, you can find this on the the Game Details page for your game, this can be reached by clicking on your game’s name in the breadcrumbs at the top of the deltaDNA portal. Please don’t send DEV data to your LIVE environment and vice versa, that just confuses everyone! The deltaDNA listener can accept either GET or POSTs from the MAT postback, the latter is preferred. user_id – This is the deltaDNA userID that was passed to MAT in step 2) above. And any combination of the following optional MAT fields can be sent. The following template can be used on the MAT platform. The MAT attribution parameters that are sent to deltaDNA will appear in your data under the matAttribution event with their parameter names prefixed with matAttr e.g. matAttrPublisher. They will also be applied to the user records as use metrics. The MAT cost field is sent as a floating point numeral in USD, deltaDNA will convert this to an Integer in USD Cents to be consistent with currency formatting in other deltaDNA events. The acquisitionChannel parameter field in the matAttribution event is built up from the concatenation of the publisher_name and sub_publisher fields (with a “:” between) truncated to 72 characters, or if neither are defined the string “ORGANIC” is used.